MMTC-PAMP has the largest BIS-certified refinery for gold and silver in India. 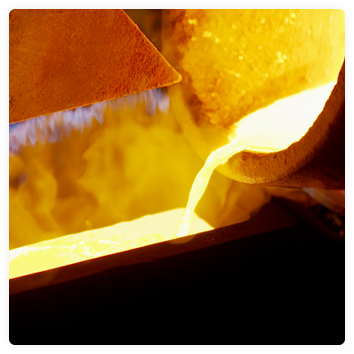 We currently have an installed refining capacity of 300 tons of gold and 600 tons of silver per year. We process two distinct types of metal-bearing material; ore from our mining partners, and scrap material from the jewellery Industry. Our modern facilities have the technology to refine gold and silver up to '999.9+’ (four nine plus) purity to meet the highest technical and quality requirements across the globe. We are also the only Indian laboratory to have successfully participating in the LBMA Proficiency Testing for gold - a global assessment evaluating the quality of world class laboratories across the globe, and we are proud to have attained a top tier rating for four years in a row. As an external affirmation of our high standards, our parent company, PAMP, is one of the only three 'Approved Good Delivery Referees' of both the London Bullion Market Association (LBMA) and London Platinum and Palladium Market (LPPM), and are responsible for the testing of samples, the provision of reference samples and other functions in support of the Good Delivery system globally. Our assay laboratory bring to India assays of the highest quality and reliability. Our comprehensive range of services for the industry includes fire, spectrometric, ICP, X-ray and chemical assays. Our assay laboratory is certified by the International Organisation for Standardisation (ISO / IEC '17025 : 2005' Accredited) by NABL. Our laboratory provides much needed infrastructure services to the Indian gold ecosystem in many ways. For instance, we provide the gold reference material, which are used across India in hallmarking centres as the benchmark for purity of gold.